Lidar, which is an acronym for light detection and ranging, is the optical analog to traditional radar (radio detection and ranging). Because optical frequencies are so much larger than their radio wave counterparts, lidar allows for much higher bandwidth signals and therefore much higher resolution detection. Just as radar is a highly diverse field using a variety of radio wave sources, lidar lasers also come in a vast range as well. The primary driver between which type of lidar laser you will need for your application is whether or not you are measuring moving targets or not. For stationary targets, where distance is the only thing being measured, short pulsed lidar lasers are used to measure the roundtrip time-of-flight of each pulse and therefore calculate the distance to the target. But, if a target is moving and you need to measure its speed, single frequency lidar lasers are required in order to accurately measure the Doppler shift and calculate the objects speed. 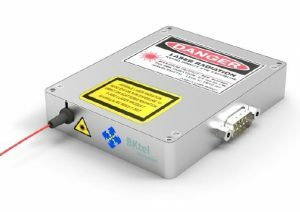 On this page, you will find a list of all of the lidar lasers we offer ranging from passively q-switched microchip lasers to single frequency fiber lasers. To see a full list of other applications RPMC lasers are used for please check out our applications page by clicking here.